Each one of us is born with unique body constitution, which is our ‘PRAKRITI’. It is determined by our genetics, mother’s physical and emotional state during pregnancy, social environment, season and geographical location at birth. According to our ‘Prakriti’ one or combination of two doshas will be dominant in our body. Unhealthy lifestyle choices, wrong choices of food that does not suit our body type, stress and mental pressure leads to imbalance of doshas- which is called ‘VIKRITI’. Most of the time when we suffer from health problems, weight gain, mental health issues, it is because of ‘VIKRITI’. Ayurvedic body types are described according to physical structure, digestive system and cognitive nature of a person. Doshas are foundation of Ayurveda. They comprises of energetic forces of nature, which is essence of our existence in the world. 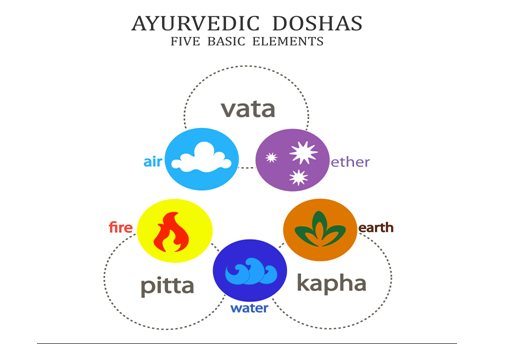 There are three types of doshas, which are made from combinations of bio elements. All three of them can be found in everyone and everything, but in different proportions. Maintaining a balance among all three doshas is the key to good health and longevity.